How can palaeontologists reconstruct the relationships between animals that lived tens of millions of years ago? How can we tell who is closely related to whom, and what that means for how they evolved? In the modern world of genetics, it may seem odd that we can do these kinds of analyses, but long before we had the technology to compare the DNA of living species biologists and palaeontologists had been using cladistics (the technique used to determine relationships) based upon anatomy. Of course we hardly have whole animals to work with, but there is a surprising amount of information to be gained from bones – their shape and structure can tell us huge amounts about how these animals lived, and can reveal their evolutionary history. Cladistics works by comparing numerous fine details between large numbers of organisms, be it trees, insects or pterosaurs. We can look at their DNA, bones, muscles, physiology and much more. Since all organisms (if you go back far enough) have a shared evolutionary history, the more similar two species are, the more closely related they must be. Dogs and cats have a very close ancestry – we can see that from their similar teeth and build, they are less closely related to bears and raccoons (changing teeth and skull), less close still to other mammals (but still share fur, milk and ear bones), then they are less close to reptiles (but still share features on the skull) and so on. By using hundreds of these small anatomical features (for fossils at least) we can see which characters are shared, and which are different and from this calculate which other species they most closely relate to. What we reconstruct is a ‘tree’ of relationships with closely related groups (be it species, families or even kingdoms!) sharing ‘twigs’ and then more distant relationships branching off, each with their own twigs. Where branches split we are interpreting an evolutionary split, where two groups have gone their separate ways and gone on to produce different organisms. Here we can see how cats and dogs split from each other after they had separated from the rest of the carnivorans, which in turn had split from the other mammals. Pterosaur origins – where did the come from? Now comes the tricky part of cladistics. Pterosaurs are really, really strange. As a result of evolving flight, their bones and bodies underwent some enormous transformations. Essentially, much of the information we would look for was lost, so there is little to tie pterosaurs to other groups through shared characters. This means that it is actually quite hard to see how pterosaurs fit in the great tree of life. We do know that they are diapsid reptiles – to special holes in the skull give that away, but after that things get tricky. It really boils down to two possibilities - the dinosauromorphs (that also produced the dinosaurs) or the basal archosauromorphs (that spawned many lineages). Pterosaurs share some characters in common with each of the two groups, primarily features of the legs with the dinosauromorphs, and a few scattered ones, mostly in the neck, with the archosauromorphs. There is not much to chose between them, and even many pterosaur experts disagree, but right now the weight of evidence falls (just) on the side of the dinosauromorphs. 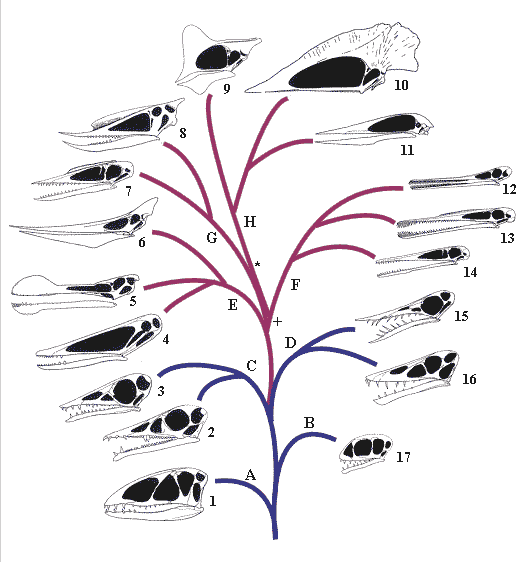 Pterosaur relationships – who is related to whom? We use the same techniques to see how the various pterosaur families and species are related to one another. Here we are on rather firmer ground as although much of their anatomy makes it hard to compare them to other reptiles, it is of course relatively easy to compare them to other pterosaurs that share and have modified those characteristics. The pterosaur tree has major branches, each here representing a family of pterosaurs and several major sub-branches are also shown. There are still a few more things we need to sort out. Although the tree here is ‘complete’ a few branches are unstable and might move if we get new information or new fossils that fill in a few gaps for us. For example, we are not sure what the most basal pterosaurs are – here it is the dimophodontids, but many think the anurognathids are more likely candidates as they have several features not seen in other pterosaurs that are considered to be more primitive. Still, it is a good representation of how we perceive pterosaur relationships and their evolutionary history. Figure caption: based on the original by Dave Unwin (with permission). Clades: A Dimorphodontidae, B Anurognathidae, C Campylognathididae, D Rhamphorhynchidae, E Ornithocheiroidea, F Ctenochasmatoidea, G Dsungaripteroidea, H Azhdarchoidea. Genera: 1 Dimorphodon, 2 Eudimorphodon, 3 Campyognathoides, 4 Istiodactylus, 5 Ornithocheirus, 6 Pteranodon, 7 Germnaodactylus, 8 Dsungaripterus, 9 Tapejara, 10 Tupuxuara, 11 Zhejiangopterus, 12 Ctenochasma, 13 Gnathosaurus, 14 Pterodactylus, 15 Rhamphorhynchus, 16 Scaphognathus, 17 Anurognathus. Looking at the tree we see the rhamphorhynchoids in blue at the base and later on the pterodactyloids (red) evolve. In cladistic terminology we should not really use the term rhamphorhynchoid as it does not include all of the descendents of that group (here the pterodactyloids) which leaves us with the terrible term ‘non-pterodactyloid pterosaurs’. By convention therefore, we keep the name just for convenience. There is a major shift in the anatomy of pterosaurs as the pterodactyloids evolve from the rhamphorhychoids and of course there are certain specialisations that characterise each family or group (and therefore they group together on the tree). For example the loss of teeth in all of the azhdarchoids (H) or the low crest in the dsungaripteroids (G). The proximity of the branches to each other determines how closely related to each other they are based on their most recent shared ancestor so the dsungaripteroids and azhdarchids share an ancestor at the point marked * and these two share and ancestor with the ctenoschmatids at point +. Similarly, all the three groups in the ornithocheirids share a common ancestor, and within them Istiodactylus and Ornithocheirus are more close to each other than Pteranodon. These kinds of trees are very important for us as they allow us to make important inferences about the evolution of certain groups. Since we know that for example that all of the pterodactyloids share a common ancestor then the descendents of that ancestor should have inherited its characteristics. In other words a feature of the 3rd toe shared by ornithocheirids and dsungaripterids we can predict would be found in the ctenoschmatids too, even if we can’t see it because, say we have never found a ctenochasmatid with a preserved foot. So we can actually increase our knowledge of pterosaurs based on these trees. Top stuff! Hopefully this will have given you the basics when it comes to pterosaur relationships. Quite simply pterosaurs do not have as many cladistic characters as one might expect in a group so varied as their anatomy has been homogenised thanks to the constraints of flight. This makes pterosaur relationships one of the ongoing hot topics in pterosaur research as even a single new find or a change in one character can dramatically alter the pattern of the tree and how we view their evolutionary history. Still, the trees presented here are actually quite stable and there is a broad agreement between all of the major workers in this field and therefore a good understanding of how pterosaurs evolved and how they are related to one another and to the reptiles at large. And don’t go calling them ‘flying dinosaurs’!